NEW BERN, N.C. - Hurricane Florence’s torrential rains pelted areas of North Carolina that are home to more than 1,500 industrial animal operations with more than 1,000 nearby animal waste storage cesspools. These operations have the potential to annually produce as much as four billion gallons of wet swine waste and 400,000 tons of dry poultry waste, according to an exclusive analysis by EWG and Waterkeeper Alliance. The organizations overlaid locations of concentrated animal feeding operations, or CAFOs, with government rainfall estimates to produce an interactive map that details Florence’s potential impact on vulnerable operations in the state. Clicking and zooming in on a location shows the estimated amount of rain each CAFO received from Sept. 14, when Florence made landfall, through Sept. 16, and the potential amount of waste produced or stored at each site. The groups calculated the potential waste stored at each site by using North Carolina permit data, the Agricultural Census from the U.S. Department of Agriculture and manure-production-rate data from the North Carolina Agricultural Chemicals Manual. A link to the methodology is here. There are 926 concentrated animal feeding operations, or CAFOs, housing more than 3.8 million hogs and 578 poultry CAFOs holding an estimated 35 million fowl in areas where the National Weather Service said flooding was “occurring or imminent” after Florence. Livestock at those 1,504 concentrated animal feeding operations are capable of producing four billion gallons of wet waste and more than 400,000 tons of dry poultry waste each year. More than a third of those sites received an estimated 15 to 19 inches of rain, and more than one-fourth saw more than 20 inches. There are 123 industrial hog operations and 40 industrial poultry operations in or within 500 feet of the 100-year floodplain that received at least 15 inches of rain. Livestock at those 163 sites are capable of producing more than 395 million gallons of liquid waste and more than 27,000 tons of dry waste a year. Federal standards require waste pits in North Carolina to be designed to withstand a so-called 24-hour/25-year rain event without releasing manure. In areas where the National Weather Service said flooding was occurring or imminent, more than 1,000 waste pits received more rain than the 24-hour/25-year rain event defined for that location. Of those, an estimated 35 pits are in the 100-year floodplain and received over 15 inches of rain. Those pits alone are capable of holding more than 129 million gallons of animal waste. The map below shows colored bands of estimated rainfall amounts in North Carolina’s coastal plain from Sept. 14-16. The dark diagonal lines show the zones of rainfall expected during a 24-hour/25-year rain event. In all of the zones except for the one with the lowest expected rainfall (in blue), the total estimated rainfall was well in excess of what the waste pits were designed to withstand. “Waste mismanagement at industrial animal agriculture operations threatens public health and environmental quality even under sunny skies,” said Will Hendrick, staff attorney and manager of the Pure Farms, Pure Waters campaign at Waterkeeper Alliance. “That threat is disproportionately borne by communities of color or low wealth and it is exacerbated, given the concentration of production in the coastal plain, by increasingly frequent and severe storms like Hurricanes Matthew and Florence." 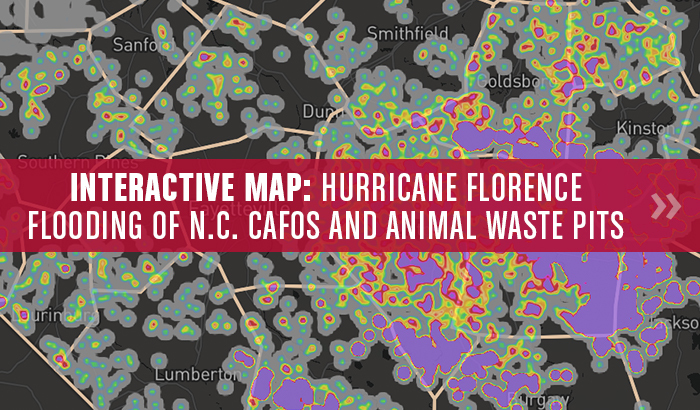 EWG and Waterkeeper Alliance will continue our analysis of Hurricane Florence’s impact on CAFOs in North Carolina’s coastal plain. The Environmental Working Group’s mission is to empower people to live healthier lives in a healthier environment. With breakthrough research and education, we drive consumer choice and civic action. EWG is a nonprofit, nonpartisan organization dedicated to protecting human health and the environment. For more information, please visit www.ewg.org.